Up until the New Year, I was using a newsletter to connect with readers and writers each week, but that felt too intrusive. Yet, I had promised several great authors and wonderful readers that I would include them on a newsletter. What better way to start the New Year then meeting some refreshing authors and some wonderful readers? 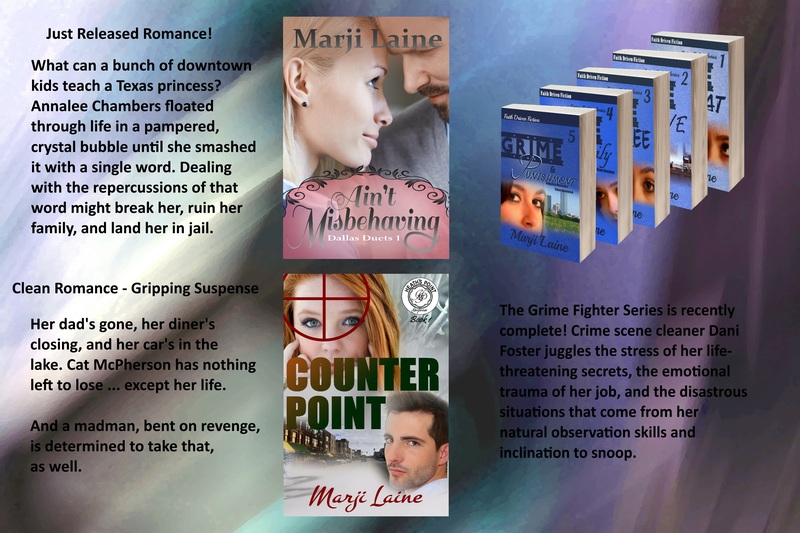 Marji Laine Clubine is more than an author. She’s a publisher. She’s my publisher, and I’m her cohost, and so blessed that she asked me to join her each month on Down Publishing Laine. If you haven’t caught the show, be sure to mark your calendar and join us on the first Tuesday of every month. I’m so delighted to get to introduce you to her (if you don’t know her already). Even though Marji and I haven’t met in person–or we did and don’t remember–we have had some misadventures over blog talk and on the phone. All of them fun. Marji’s a former homeschooling mom who’s not looking forward to an empty nest. Thankfully, her final two graduates are gracing her with their presence for a little while longer. 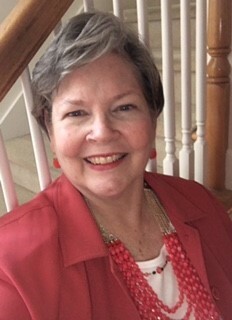 She loves family game night, hosting a weekly high-school/college Bible study, directing her church’s children’s choir, and singing harmony in the adult choir. When she’s not publishing others’ books or working on her own, she’s taking spontaneous road trips with her trusty camera and a couple of besties, or she’s scrapbooking or cover-making with a Hallmark movie on in the background. 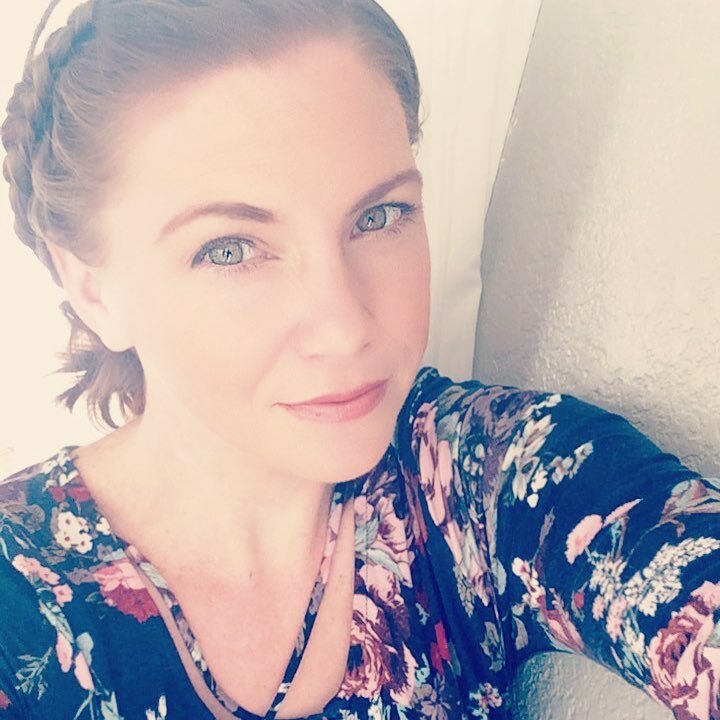 She love nanograms, Marvel movies, Hand and Foot, worship music, Tim Hawkins, “When Calls the Heart,” and “Live PD.” She prefer mountains to beaches, dogs to cats, winter to summer, and cookies to any other dessert. I have a passion for encouragement and spreading hope, and my goal is to show that through all of my stories. I was editing my latest book, Ain’t Misbehaving a couple of days ago. I hadn’t read the manuscript in probably 2 or 3 years and was reduced to tears at least 4 times. The take-the-glasses-off and find-a-tissue type of tears. The characters in my stories are raw, broken, and struggling to follow the Lord just like I am. Just like most readers are. I swear they are real. In fact, the building where I situated CJ Whelen – my hero in Ain’t Misbehaving – is in downtown Dallas in the Arts District. And every time I drive past it on the freeway, I can’t help but glance up to the 18th floor, northwest corner balcony. One of these days, I’m just sure I’ll see him standing up there. 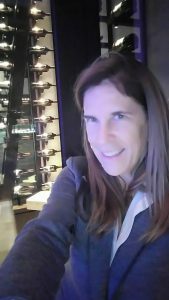 I’ve connected with and stayed connected with many authors I’ve met at conferences. James and I have been in contact for three or four years. 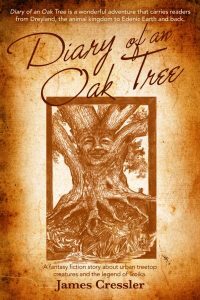 I was intrigued by Jim’s Diary of an Oak Tree, a unique story for children, which is also a learning tool. James is multi-faceted in his writing. James is a 2012 graduate of Valencia College. He lives in Orlando with his wife, Julia. 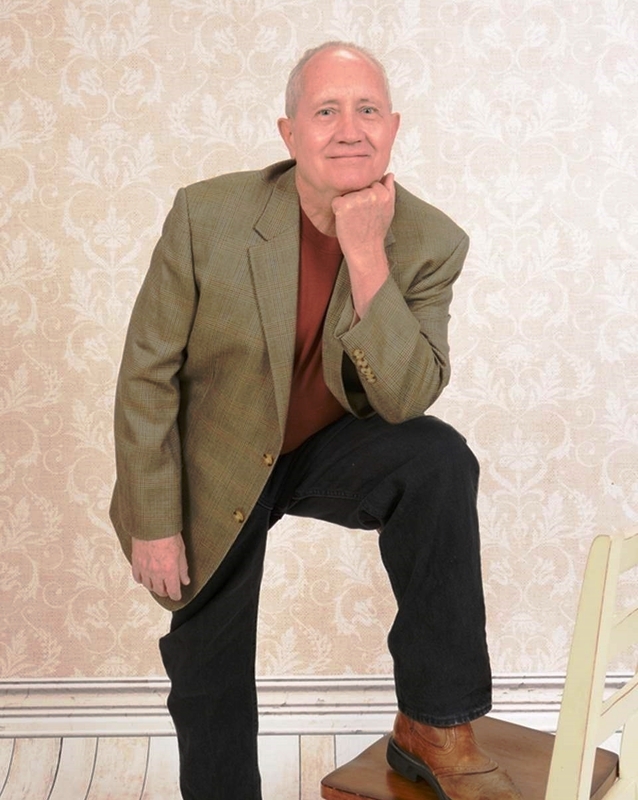 His twenty years of Army service in the Cold War and Desert Storm gives Jim some of his writing inspiration. He is currently writing Demimonde, a fantasy fiction about a mysterious entity that traps and enslaves people in its half-world where reality, insanity, and addiction reign. Ben Astray escapes from Baser’s corner bars and Shantytown vices to Ism Harbor and boards a Treatment Ship to Sobriety Island. Will he die at sea, find truth and recover or is it all madness? 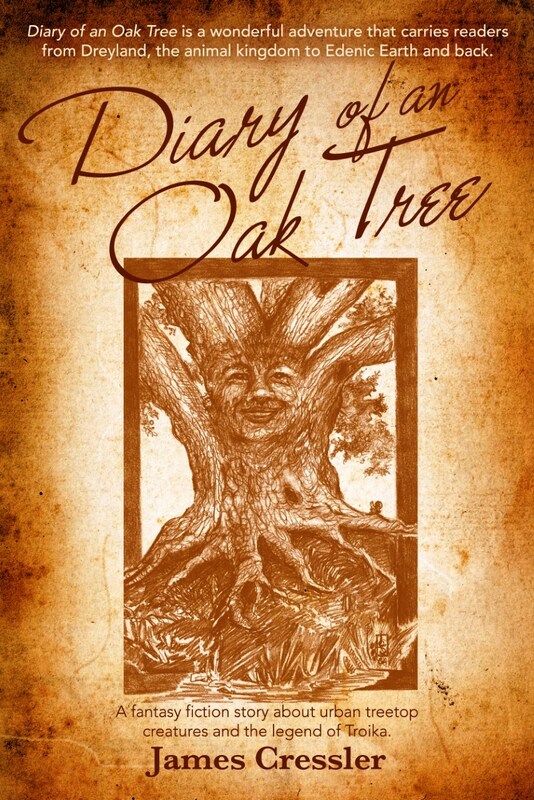 Diary of an Oak Tree is illustrated and LifeRich did a perfect job on the cover and pagination. But more importantly, like all of my work, it’s different. The reader gets to live the life of Notch, the governor squirrel, Dagger the cat, or the wayseer raccoon, Sage. They time travel to post-Edenic Earth. They learn a new language. They escape our world and live in another where everything is possible, even animated mother oak trees. I write to create a legacy, something that will endure the test of time. Sharon K. Connell was born in Wisconsin and lived there for five short days. From that time through college, she lived in Illinois. For over twenty years, Sharon made her home in Florida where she graduated from the Pensacola Bible Institute. She has also lived in California, Ohio, and Missouri. Now retired from the business world, she resides in Houston, Texas, enjoying every minute of her writing career. Except for six, Sharon has visited every state in the United States. She has also travelled to Canada and Mexico. The stories in her four published novels reflect some of the experiences she has had in her travels. Sharon writes stories about people who discover God will allow things to happen in your life that will help you grow and/or increase your faith. 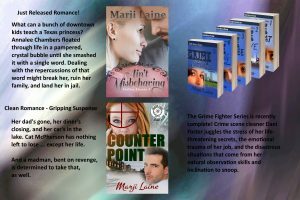 Her genre is Christian/Romance/Suspense, with a little mystery and humor added for good measure. Readers love to read my books because the stories are written in a way that draws the reader into the lives of the characters. My characters have flaws just like real people, and struggle to find answers, just like real people do. The style of writing I have adopted helps the reader to feel the emotions of the characters. I also include twists and turns which makes the story suspenseful and adds an element of mystery. But of course, I always have moments of humor, because laughter is good for the soul. June is a good friend of mine. We have gone on a few adventures, some planned and some accidental, but all of them fun. We met when I fell in love with her hero in Ryan’s Father, and our friendship grew from there. I love June Foster’s quirky characters and plots. 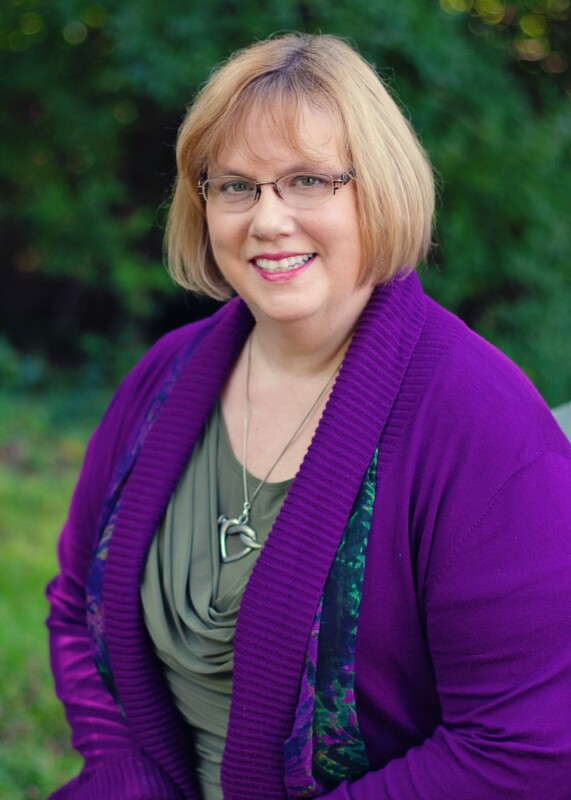 An award-winning author, June Foster is a retired teacher with a BA in education and MA in counseling. 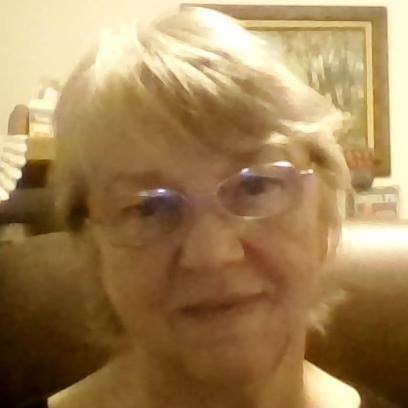 June has written four novels for Desert Breeze Publishing. The Bellewood Series, Give Us This Day, As We Forgive, and Deliver Us, and Hometown Fourth of July. Since then she’s also written Ryan’s Father, Red and the Wolf, a modern day retelling of Little Red Riding Hood, The Almond Tree Series: For All Eternity, Echoes From the Past, What God Knew and Almond Street Mission. 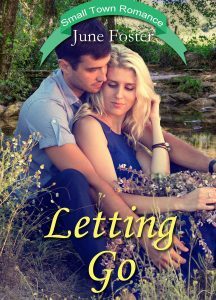 Also available is Lavender Fields Inn, Christmas at Raccoon Creek, Restoration of the Heart, Letting Go, and Prescription for Romance. Find all June’s books at Amazon.com. June enjoys writing stories about characters who overcome the circumstances in their lives by the power of God and His Word. Find June online at junefoster.com. Great question. First I need to think about my target audience—people who might read my books. If I’m correct, women between eighteen and ninety read my work. Many are Christians, some are seeking the Lord, and others are working through spiritual issues in their lives. I believe they will like my work because they can identify with the struggles, the aspirations, the joys, the blessings, and changes God is making in their hearts. My characters deal with anger, obesity, low self esteem, abortion, loss, and even homosexuality, not to mention some who just enjoy life. And finally, others will enjoy my work because they will read a great story that keeps them engaged. I met Linda Maran through acquisitions, and fell in love with her style. 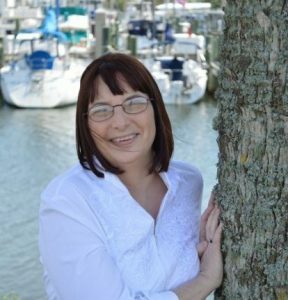 Linda began writing poetry as a teenager and then turned to food and self-help article writing in her adult years. Now, in her sixties, she is blessed to have her first novel published, which has been her goal for many years. She enjoys reading, writing, research, painting, music, playing drums, painting, walking, contemplative prayer, and sampling new eateries. Her personal experiences, both good and challenging, have become material for stories. This helps her to write about what she knows best, which lends authenticity to her platform. She has been married for thirty-eight years, is a practicing Catholic, and has been surrounded by musicians most of her life. She resides in both city and country settings. 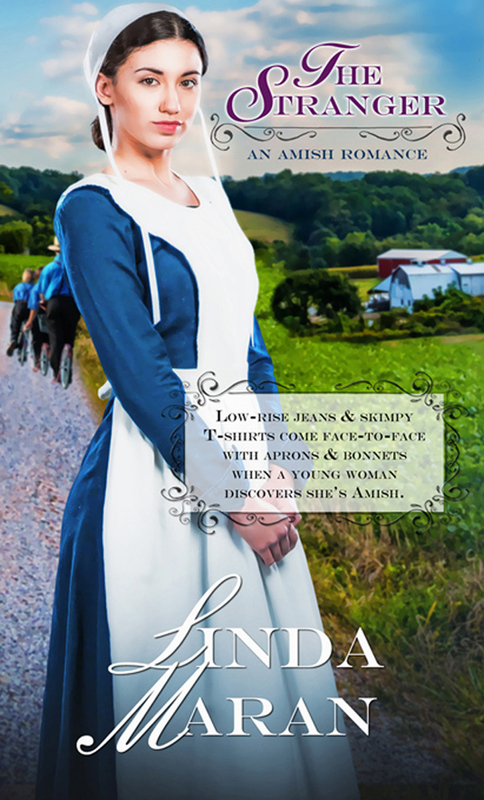 Why Linda believes readers will enjoy her work? I think readers will enjoy the book because it seems that at one time or another in our lives, we long to be part of something. We want to fit in. For some of us this happens as children or as teens, and for others at various times in our lives. When we get a new job. Join a new church. Meet our future in-laws. A part of being human, for me, is to know I am loved and belong to specific people. Be they my spouse, family or good friends. The heroine in the novel, Kristen, is trying to find herself and see where she fits in while experiencing the new sense of family and people who rally around her. I think we all want that, and for those of us who do not always have it, it encourages us to not lose hope. God provides for all of us in His own time and sometimes in the most unexpected ways. Born in Nigeria, West Africa, where her parents served as missionaries, Shirley is passionate about disciple-making, which is manifested through a myriad of ministry opportunities that include biblical counseling, teaching Bible studies, speaking at conferences, writing, co-hosting a radio/TV program for women, and serving on the national advisory team for The Addiction Connection. 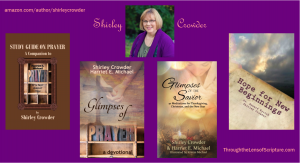 Three published books and two soon-to-be released devotionals were contributed to, authored, or co-authored by Shirley. She has written a newspaper, Student Life, Seek Magazine, and Woman’s Missionary Union. 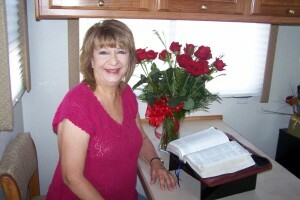 Shirley has spiritual children and grandchildren serving the Lord in various ways throughout the world. Writers are busy people who usually have a gazillion projects in the works a the same time. These three devotionals examine what the Bible says through explanation and personal stories that the Holy Spirit can use to ignite or deepen the readers passion to now Him better. “Hope for New Beginnings” adds in-depth challenges to the reader as he or she interacts with the biblical principles and develop concrete steps for spiritual growth. The “Study Guide on Prayer: It’s Not About You by Harriet E. Michael” guides you, as you read a chapter in Harriet’s book, to delve deeper into the teachings, principles, and/or practices from each chapter. Shirley’s Bible study guide allows readers to go even deeper as they are studying Prayer: It’s Not About You. Her devotions include personal stories, some heartwarming and others full of humor. She writes encouragement and comfort for Christ-followers. And in all of her writings, she persuades the reader to draw closer to God. While we know that all authors should be readers, not all readers are authors. However, where would an author be without someone to read their work? Here are a few readers, I’ve asked the same questions to–purposefully. I wanted to see the variety of answers and introduce authors to the audiences for their chosen genres. I met Tina online through our mutual friendship with author, Linda Maran, and she gladly accepted my invitation to answer these questions. In what state or region do you reside? Besides reading, what is of major interest to you? I am also interested in Film and Digital media/graphic design. Favorite genre is Inspiration Romance, which includes both historical and modern equally. 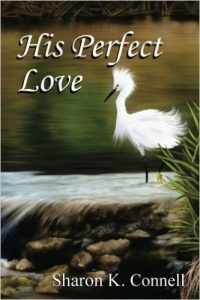 I am a sucker for a good romance, but I prefer a “clean” and non-graphic romance, which is why I am drawn to the Inspirational Romances. What is the book that you consider your all-time favorite? All-Time favorite would be Christy by Catherine Marshall. I am currently reading Sweetbriar Cottage by Denise Hunter. 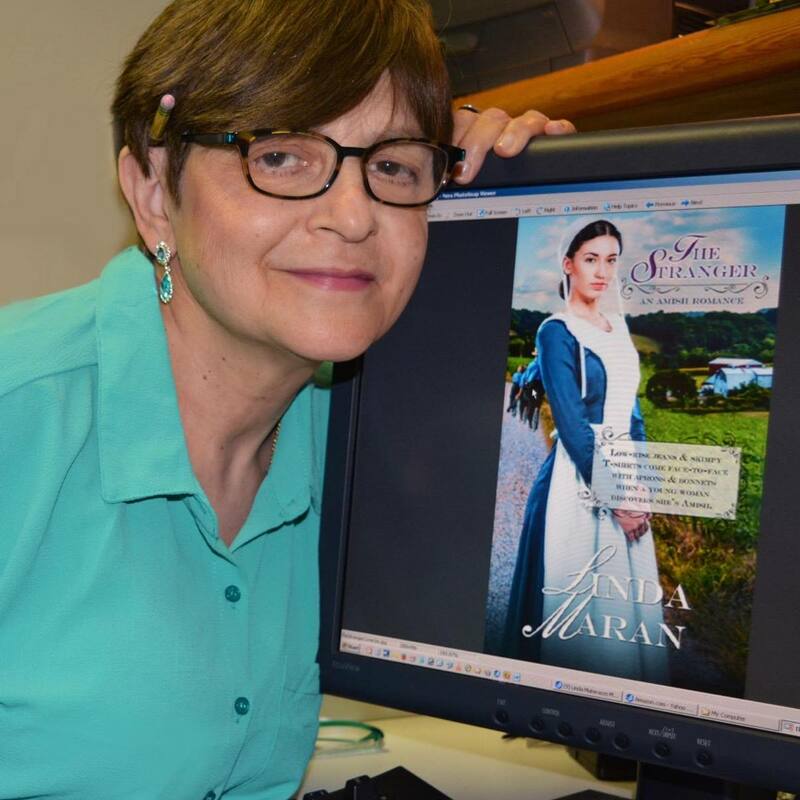 Marji’s back–this time as a reader, but she’s also a publisher, so authors might want to take note. I live in North Dallas. I group up in the suburbs on the east side and have lived in Northeast Texas (including college years) since I was 2 years old. My major interest is publishing other authors’ books – I really love my job. But I also love leading our high school/college Bible study and directing our church’s children’s choir. Oh, and family game night – LOVE family game night! I couldn’t possibly narrow it down to one. I love the story of Pride and Prejudice, though I confess I only read half of the book. I’ve only read a handful of books more than once – most of them children’s chapter books when I did read-alouds as a teacher. I think my current favorite, though is the Rogue series by Kristen Hogrefe – masterfully written and full of action, mystery, and suspense – and romance. Yep. Gotta have some romance in it! Another confession, now that my new job requires so much reading (editing) I seldom read for enjoyment. I find I’m correcting too much. But I do listen to books on Audible. I just finished Eason’s Elite Guardian series and am now listening to Joanne Fluke’s Hanna Swensen mysteries. I love the Hallmark movies based on these books and having fun with more of the stories. Elizabeth “Betty” Noyes and I met as critique partners and we have become fast friends. I have been privileged to listen to her provide in-person critique, and I have been blessed to have her critique my work. I know she reads with a different eye, and I’m excited for you to meet her as a reader. Favorite genre to read is sci fi; to write is romantic suspense. Gone With The Wind followed closely by The Stand. Sarah is one of my favorite persons in the world. We met when were very young teenagers. She and her brother lived next to my grandmother’s “vacation” home on Merritt Island, and we spent a lot of time on the river and in Sarah’s house. Sarah’s beautiful mother, Nancy, was the one who encouraged me to keep writing all those years ago. We reunited for a sad day last year, but we’ve stayed in contact since, and I was very interested in getting Sarah’s answers to these questions. Murder mysteries. I love to hide under the covers and lock all the doors and windows. Hiroshima, John Hersey. A tough read and life-changing reading experience. Dawn of The Belle Epoch, The Paris of Monet, Zola, Eiffel, Debussy, Clemenceau, and Their Friends By Mary McAuliffe. 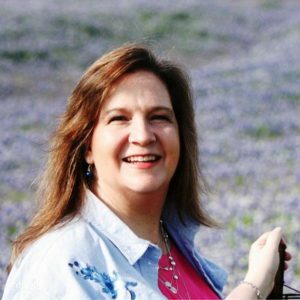 Fay Lamb writes emotionally charged stories with a Romans 8:28 attitude, reminding readers that God is always in the details. 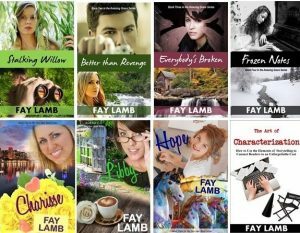 Fay donates 100% of her royalties to Christian charities. Storms in Serenity is the first book in Fay’s Serenity Key series, which will release in March of this year. 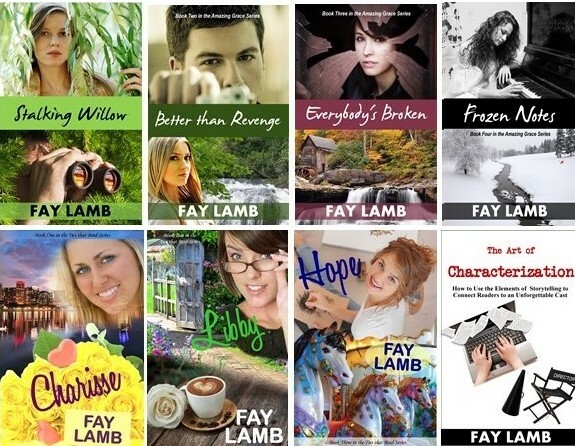 Fay’s other series include, Amazing Grace and her novels, Stalking Willow, Better than Revenge, Everybody’s Broken, and Frozen Notes. The Ties that Bind Series includes Charisse, Libby, and Hope. Delilah, is coming soon. 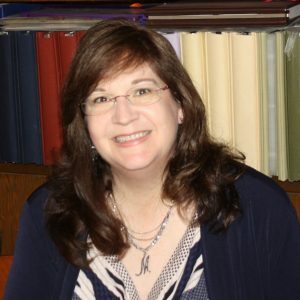 Fay’s is also the author of The Art of Characterization: How to Use the Elements of Storytelling to Connect Readers to an Unforgettable Cast. Why do I believe readers will enjoy my work? When I sit down to write, I don’t plan on writing a book. I plan on creating a world inside of my readers’ imaginations where they can escape and unwind. I imagine my characters on stage, that I’m a part of the cast, and I’m in the midst of the story with them. In that way, I am sure that my readers will be in the story as well and not simply watching the stage from the audience. A special thank you to all who took part in the spotlights. I’m praying that reader and authors alike will have a very Blessed and Happy New Year!